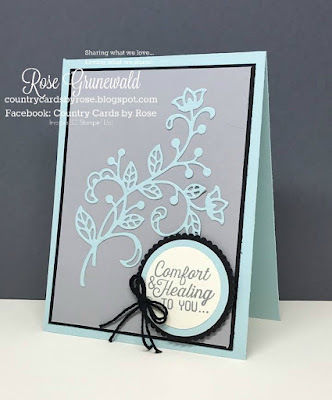 Country Cards by Rose: Skip to Sale-a-Bration with Flourishing Phrases! There are just 3 days left of Sale-a-Bration! Did you get all the free stuff on your wishlist? Today I have a card tutorial using a bundle that will let you skip right to the free stuff! Flourishing Phrases! I got this bundle just recently, and I love it! It was a the top of my wishlist since the catalog came out, and Sale-a-Bration was the perfect time for me to buy it so I could get some free product. I love the soft colors of this card against the black - what a sharp contrast, right? Gather your supplies so you can make this card! Adhere Smoky Slate cardstock to Basic Black cardstock with snail adhesive. Adhere these layers to cardbase with snail adhesive. Die cut flourish in Soft Sky cardstock using Flourish Thinlits. Use Big Shot Die brush to easily remove the small parts. 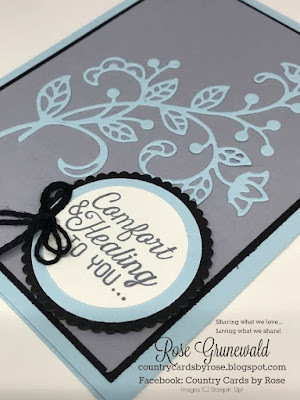 With die cut flourish wrong side up on silicone mat, apply multipurpose adhesive with stamping sponge. Adhere to cardbase. Stamp greeting in Basic Gray ink on Very Vanilla carstock and punch with 1 ½” circle punch. Adhere to Soft Sky 1 ¾” circle with snail adhesive. Die cut 2” scalloped circle from Layering Circles framelits in Basic Black cardstock. Adhere to circles with snail adhesive. Adhere greeting to cardbase with Stampin Dimensionals. Adhere Basic Black solid Baker’s twine bow with mini glue dot. What a simple versatile card that you can make a various colors. Everyone needs sympathy and get well cards, so you could even make a stack of these for a beautiful hand-made gift. And remember, this clear-mount bundle is only $59.25, so you get to hop right to the Sale-a-Bration and pick add that last free item from your Sale-a-Bration wishlist to your order! Don't wait until the last minute - the free items will run out, and when they're gone, they're gone! I have listed all the products I used to create this card below. Clicking any of the images will take you directly to my online store - don't forget to use my March host code CJ2P2JYPK when placing your order so you can be entered into my monthly prize drawing! I so appreciate your business - it's how I can keep bringing you fun projects like this, and I send a special thank you for every online order I receive!